This Gold Choker Necklace set has a necklace featuring seven circular plates arranged in a line and studded with a pink stone at the middle. 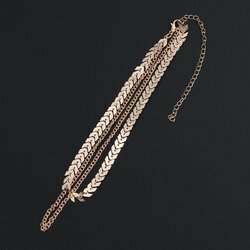 We are amongst the most reputed names in the industry, offering Gold Choker Necklace. Being the leading names in the industry, we offer designer and classy array of Gold Choker Necklace Set that are durable in nature and have antique looks. We offer them in varied eye-catching looks and add special ouch to the neck of the wearer. Gold Choker Necklace Set is intricately designed.